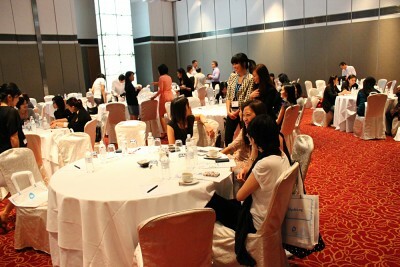 STJobs, Singapore’s leading online jobs portal, hosted its inaugural STJobs HR Connect 2012 at the Singapore Marriott Hotel on 2 November 2012. Some 100 Human Resource (HR) Professionals in Singapore were specially invited to the exclusive event to network and to sit in on talks by experts in the HR industry. Organised by STJobs (previously ST701 Jobs), under the ST701 umbrella in Singapore Press Holdings, this is the first of the STJobs HR Connect event that will take place once every quarter of the year. While the main objective of the event is to allow HR Practitioners from across all industries to mingle and network, STJobs also engaged two guest speakers to share relevant topics of interest. Professor Sattar Bawany, Senior Adviser of Training Edge International (TEI) and Strategic Advisor of The International Professional Managers Association (IPMA) in Asia Pacific touched on issues surrounding employee engagement, how to keep employees connected and committed during uncertain economic times, and how highly engaged employees are crucial for organisational success. Mr Laurence Smith, Managing Director of RBL Asia spoke about the latest research identifying critical competencies in order for HR to be an effective business partner and have strategic impact. In addition, he shared the 6 Competencies of HR, as well as its implications. Along with a high tea buffet, event attendees had the opportunity to take part in a lucky draw to win a hotel room stay voucher and dining vouchers.